I use GMail a lot. Not only is it increasingly popular among many users, it is eloquently speedy and is widely compatible with a host of browsers. One of the best features by this Google product is the spam filter. There was a time in which mails selling all sorts of products, propagating all kinds of messages, and spewing out all kinds of garbage which made reading emails a chore. In came GMail and the rest is history. Occasionally, a few legitimate mails get caught in the spam folder, but that is a small price to pay in order to get a cleaner InBox. Many of these spam mails hardly deserve any reading or action. Sometimes, the quickest fix is to simply hit the DELETE button and voila! There goes the thorn that threatens to irritate and frustrate. Sometimes, people do send out other kinds of mail that border upon hate mail. Whatever the message within that spam, there is a general pattern. First, there is a title that grabs attention. It can be based on a famous personality that screams out: "Obama lies!" and so on. Like tabloids that sells based on sensational headlines, spam mails market themselves in order to win clicks to their products and services, the more sensational the title is, the more likely it is going to get people to click on it. Second, it is usually based on a famous name, company, or a nearly legitimate name. After all, putting "Miley Cyrus" or "Tom Cruise" in the headlines will grab attention. Third, it masquerades itself as the real deal. It pretends to be written by some famous or highly qualified individual to authenticate the email. That way, it hopes to have a label of authenticity so that readers will read them with more attentiveness. Fourth, there is usually a product, a service, or a message to spread. The goal is to spread it far, spread it wide, and to spread it fast. This week, I want to reflect on the three modern fears strangling society today, and to argue that we cannot live on the basis of fear. We need to live on the basis of faith. Fear pushes people down for the sake of self. 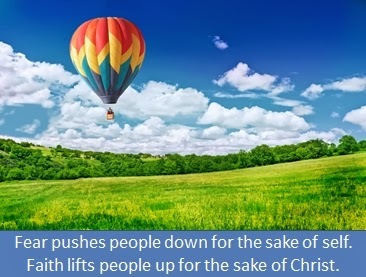 Faith lifts people up for the sake of Christ. We are living in a culture that is increasingly fanned by fear. Presbyterian minister, Ben Daniel, in observing the recent laws that had been passed in various American states notes the three kinds of fear (which I will describe later), that are strangling America's faith and relationships. He even calls it "America's Cult of Fear." From fear of communism during the Cold War to the fear of financial despair; from fear of the rise of any racial group to the fear of certain sexual orientations; from the fear of certain fundamentalists to the fear of various religious extremists. Spams work exceedingly well in a culture of fear. 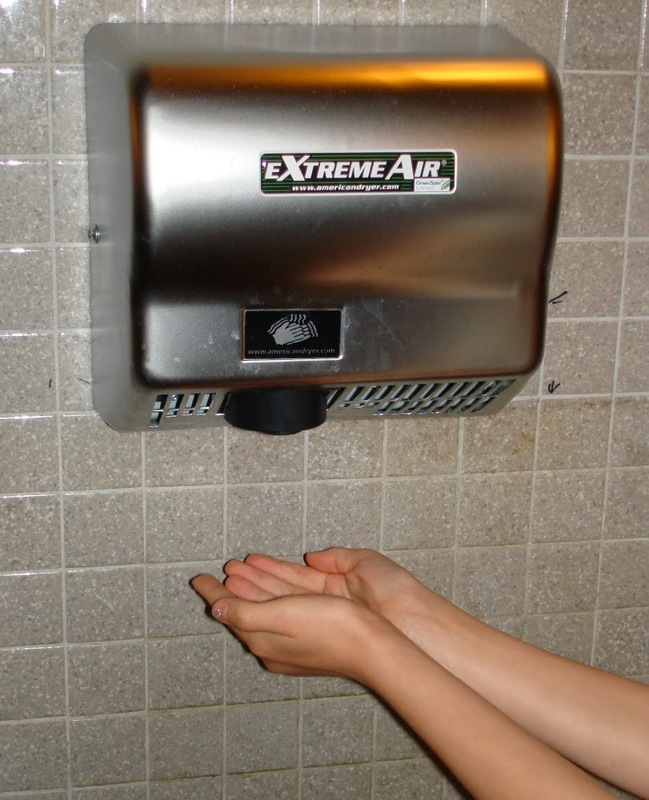 I remember a time when I watch a TV commercial that tried to instill fear about using hand dryers. Promoted by some paper company, the commercial shows the horror of magnified germs flying all over the place when the wet hands come under the hot air dryer. Following the commercial, many people become wary of hand dryers, and opt instead for the paper towels. 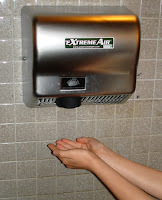 A single commercial leads to an indoctrination that "All hand dryers are bad." Another commercial I received years ago had to do with the chemical "Sodium Lauryl Sulphate." Marketed by one company that says it does not use that chemical, it is a direct (or indirect) attack on many big name companies like Proctor & Gamble, Unilever, Johnson & Johnson, Shiseido, and many others that sell personal care products. From shampoo to toothpaste; from soap to skin care products, fear is the primary weapon to make people turn away from these popular products to some unknown company that claims to be different from the rest. Fear is a powerful weapon. Daniel goes on to talk about three major fears that Americans currently face. First there is the fear of matters related to sexual orientation. Just look at some of the recent laws passed down on gay marriage. Whether one is for or against the homosexual rights, the point is that there is fear all around that drives decision making. Politicians fear losing votes if they do not cater to the majority. Left wing liberals fear losing their rights if there are inadequate laws to protect the right to be gay. Right wing proponents fear losing their voice or long-held beliefs in their long history of faith. It is not difficult to recognize this as a fear. Just take a look at how the homosexual debate had split communities all over nations. Churches too across all denominational and non-denominational lines are split down the middle. Recently, an infamous website that markets adultery tried to set up shop in Singapore. It was turned down after many Singaporeans protested about its presence. The online dating company's tagline is seductive and highly dangerous: "Life is short. Have an affair." Behind the protests lies a mixture of anger, disgust, and also fear that such a website can wreak havoc on families. Second, there is a fear of immigration. As the world becomes more globalized, people are becoming more mobile and wealthy. For example, there are many from China who are rich and want to settle in a foreign country either to retire or to invest their money in. Vancouver is a popular haven for many Chinese investors and immigrants, who often buy huge properties with cash. As a result, property prices shot up, which is great for realtors and property agents, but bad for local buyers. In America, with the increasing influx of Hispanics from down South, and the non-stop debate about how to tackle illegal immigration, lawmakers are struggling to put laws that not only appease the local residents, but also stay within the confines of human rights. A major sign of how this fear has become is the setting up of America's Homeland Security Unit which has huge powers over all the country's major airports, landing sites, and ports of entry. Enter any airport nowadays and one can be forgiven for feeling like entering a militarized or heavily policed zone. The policy is clear: Any foreigner trying to enter America is guilty of trying to sneak into the country until proven innocent. Thus, immigration officers will not allow anybody into the country until they are convinced that the traveler is a legitimate visitor or possess legal papers to enter. Is that not fear driven, even in the name of protecting the nation? The third fear that Daniel had observed is the fear of radical Islam. This is not helped by spam mails that propagate the rise of a militant Muslim agenda. It is very easy to find them on Youtube. Videos like "The Rise of Islam" has gone viral, making use of fertility rates and the fear of one ethnic group dominating over the rest. The video points a finger at "Islamic immigration." My question is: How true is this? What's the agenda of the people producing it? Is that not instilling fear and more fear in all people groups? Recently, I got a spam mail entitled: "A German's View on Islam." It is available widely on the Internet. It contains all the marks of spam mail that is trying to influence readers toward a one-sided perspective. The intentions appear innocent. It claims to make people be alert. Truth is, it instills more fear. There are many problems about this particular mail. I will share just three of them. The first is that it masquerades as something written by a legitimate person. Sources have pointed out that the author of the article is not a German called Dr Emanuel Tanay but by a Canadian called Paul Marek. The article had gone through several revisions and then promoted as something "legitimate." The second problem is that the article tries to adopt a one-solution-fits-all method to resolve cultural issues. Looking at the mail, one notices the Rwandan massacre, the German Holocaust, the Russian Communists, the Serbs, the Chinese, the Japanese, and several cases of "Islamic" influences that are radical. From the spam mail, it seems like the solution to all of these problems is to arrest the rise of radical Islam. That is so simplistic in outlook. It's like saying you can build an entire house with just one hammer! Thirdly, the biggest problem I have is that people in choosing to propagate emails like this prefer to talk FEAR instead of FRIENDSHIP. Have we forgotten the Christian imperative to love our neighbour? Which is more Christlike? Talk up fears and arm ourselves with weapons? Or to speak the gospel of peace and the love of God? How many Muslim friends do we have? Maybe when we make friends with Muslims, we will also learn that they too are very ordinary people like you and me. They too need the gospel of faith and hope. Fear alone can keep us away from sharing the gospel with them. Don't let a few bad apples spoil the rest. Jesus did not say share the gospel only with friends. He tells us to pray for our enemies and to share the gospel with all. We must fight fear with faith. We cannot allow the rise of fear to dampen our hope for humanity. Ben Daniel's reflection is instructive. Do not become a victim who victimizes others because of our fear. Be a disciple who build others up because of faith in christ. We must live wisely and with discerning minds. There is so much junk out there on the Internet that every day we live, the responsibility to clean our windshields and our shades becomes more important. We cannot prevent spam mails from coming into our Inboxes, but we can learn not to be affected by them. We can stand on the firm Word of God, believing that God's Word will help us fend off the evils and the fears that try to dampen our faith. Mails that propagate fears, delete them. Mails that sell products and services that you do not need, delete them. Mails that appear real but is false, delete them. If you do happen to open mails that cause some unhappiness or fear, test them. Test them thoroughly not with our own fears. Do not then go around looking for people who think the same way as you. Seek out truth, and not just the facts that you want to hear. Seek out truth. God's truth. 1 John 4 also leaves us with a beautiful picture of faith. Replace fear with faith. When dealing with spam, use the delete button liberally. When dealing with people, use the love button more willingly. That is the way of the gospel. For if God so loved the world that He gave His only Son, why should disciples of Christ propagate fear instead of love? Are we propagating fear or proclaiming faith? I hope we will say and do the latter.